Where are they heading, all the furniture and designs? What’s driving them, all the designers and manufacturers, the vendors and clients, in the still young 2014? Like every January, it’s imm cologne time, along with the flurry of activities in the Passagen that have set out to tell us where the furniture industry is headed. So what can we expect to see in Cologne in terms of things, people, images, role models, and legends? Let’s not waste time fiddling about wherever this or that is announced. No, by strict order of the line-up as in any chart list. And go for it full blast! So off we go with no. 1 in our charts. The roost is of course ruled by the trade fair itself. At the very latest since last year it has more than steadied. As there’s really a lot going on in Cologne now, and this year there’ll again be any amount of new items and proven things to be perused. Not much has changed in terms of the trade-fair zoning: Alongside the traditional fields of Comfort, Smart, Sleep, Prime and Global Lifestyles this time things are again to be pretty “pure”. The “established hitters in the design world” are once again to be found in Hall 11, which is why the segment is now called Pure 11. Following the success last year, the Pure Editions once again have an open and inviting look in Hall 3.2, where “visionary furniture and furnishing concepts” will be staged. Pure Village in Hall 3.1 opts once more for a mixed assortment. And here you can walk round “The House” installation, created this year by Danish designer Louise Campbell. By contrast, the Pure One platform in Hall 1, destined to promote new international design talent, is new. Albeit supplemented by the existing [D³] Contest and [D³] Schools formats. In the [D³] Professionals segment, independent designers and design studios will have the chance to present their ideas and make new contacts. And what about the Trends? Trend researchers are essentially wretched devils who take the mass of all the stuff on offer, i.e., each relies on more or less the same things, and then have to find a few sparkling items that shed light in the darkness of the future of living. And this year, they really saw the light. The current trend they have discerned is: “Combinations of all shapes and colors”. Would you have guessed? Well, OK, at least they concede: “The current trends in interior design seem contradictory.” On the one hand, there’s the wish for natural materials, on the other we are thirsting for more color. Which brings us to a veritable trend already visible in Milan in 2013: color, color, color. Yepp, you heard right. Things are getting colorful! Color is gaining entry everywhere. Cassina did it years go with the famed LCs, and at the Salone del Mobile 2013 Vitra opted for an entirely new color palette – and now, to name just one example, Thonet is also getting in on the act. A malicious mind might suggest that the “classics” have simply been sprayed in a new color and the tubular steel that hitherto was simply chromed and thus slightly anti-modern, has now received a lick of color. But you’ll soon see that the result is simply fresher and friendlier! 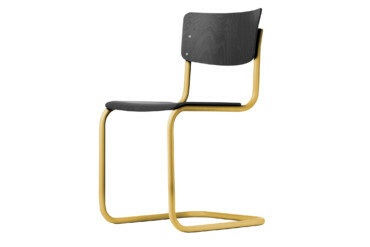 Which is why Thonet is now offering the tubular steel frames, and not only for the Mart Stam classic (the S 43) in red, black, chocolate brown, warm grey and mustard yellow, but is presenting its design classics in a state-of-the-art color range. “You have to change to remain the same,” is the conviction of Dutch trend expert Monique van der Reijden. There’s no getting round having to reinvent yourself all the time today – even if the new itself has long since become pretty ancient. NB: Everything is so colorful here! The future will be a matter of color. As can be seen from Kinnasand and in general as regards fabrics. Color combinations à la Scholten & Bajings are likewise prominent. 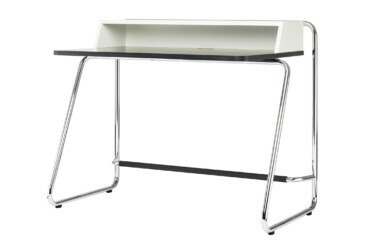 Evidently, the lady of the house once again loves sitting in her pleasant home writing those miniature “billets d’amour” – why else is an increasing number of small desks and bureaus on offer for the home? It’s well worth casting a glance at all the different things on show in Cologne. There’s much more to be discovered, of course, but not everything succeeded in getting nominated in advance for the top of the charts. The slot goes to Werner Aisslinger, A&W Designer of the Year 2014. – presented by Rolf Sachs in Cologne’s MAKK, the Museum für Angewandte Kunst. So, jump on the Harley and on to no. 4. Here, things really did the rounds, and I mean that quite literally. As Design Post is celebrating the 100th anniversary of the hall where it resides. There, a century ago the mails were sorted and the postman sent out on their rounds, whereas today it’s home to a leisurely interaction between design lovers and furniture makers. Alongside spotlighting architectural history, the Design Post team also congratulates Werner Aisslinger, by showcasing what Aisslinger has achieved together with the manufacturers represented in the Design Post – from the “Bikini Island” for Moroso to the new “ADD” modular furniture system for Flötotto. Not to forget, the other Werner, the comic, advises: “Zing, Zang, Zong – The HomeBase-Ferret chews through it all, coz, hey it’s all just DIY stuff...” So keep that ferret out!!! Which brings us to no. 5.
no. 6 is all colors, precious, and metals. So what’s at no. 7? Things are Nordic at no. 8. Which Cologne manages without even relying on Abba. Ever see the Danish TV series “Borgen”? All three seasons ran on Arte albeit with a somewhat misleading German title of “Gefährliche Seilschaften” as in dangerous insiders. And what stood in the study of Danish Prime Minister Birgitte Nyborg? You guessed right. Sofas by Børge Mogensen. Anyone focusing on Danish design classics will inevitably encounter Mogensen. And on the occasion of the anniversary of his 100th birthday, Markanto has assembled a representative selection of his long since classical design, manufactured today by Fredericia in Denmark. Things are once again Finish at the Hotel Chelsea, where Onecollection is guesting for the tenth time with the Finn Juhl Collection. The number of models in the latter has grown considerably, well beyond “Poet” and “Pelican”. The show includes Finn Juhl’s shelf panel system, the double “Chieftains” chair complete with footrest and the “Council Chair” by Kaspar Salto for the UN Trusteeship Council Chamber in New York, designed by Finn Juhl in 1951 and now refurbished. Which brings us, under the heading of “thinking furniture” to no. 10. Cologne native Stefan Wewerka has always insisted on being idiosyncratic, creating an oeuvre that blends architecture, design and art – with it having been his furniture designs that mainly led to him being considered an “antifundamentalist”. Because, like no other he has set about bending, chopping up or extending chairs. And now the “Ungers Archiv für Architekturwissenschaft UAA” has joined up with his estate and Tecta to organize a show on his furniture (he died in September 2013). The first homage in Cologne. And Wener loves it, as he has always loved the offbeat. So what’s to be seen this time round at Hallmackenreuther in Belgisches Viertel? Well, here Frankfurt-based light artist Fabian Thiele illuminates and combines old letters in a new way; he has been collecting them for ages, concerning himself with their origins and history. The motto is “Letter. Love. Light.” Okay, no idea what it means, but so what? We’ll find our way to Cologne without the light. Although here it bears following Werner (and no, as I said, I don’t mean Aisslinger) who’s main approach is: “Full Throttle!! !” So – head for Cologne!!! !